A New and Accurate Map of Scandinavia or the Northern Crowns of Sweden, Denmark and Norway. A Map of Spitzbergen or Greenland, Iceland and some part of Groenland etc. 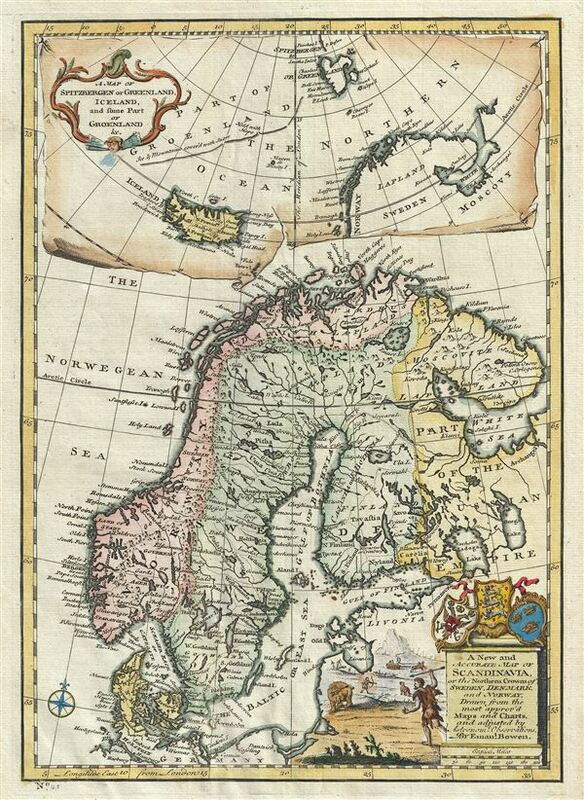 This is a fascinating 1747 map of Scandinavia by the British cartographer Emanuel Bowen. It covers Denmark, Norway, Sweden, Finland (shown as part of Sweden) and parts of the Russian Empire. The map notes several towns, cities, rivers, lakes, islands, roads and a host of additional topographic features. Mountains are beautifully rendered in profile. Of particular interest is the legendary Lofoten Maelstrom (Maalstrom) in northwestern Norway. This legendary whirlpool was the inspiration for Edgar Allen Poe's classic short story Descent into the Maelstrom. In reality, it is a periodic and powerful current caused by tidal variations in the region. A large inset in the top of the map proper includes a map of Iceland, Spitzbergen (Svalbard) and parts of Greenland. When this map was issued, the coasts of Greenland were fairly well mapped out by Icelandic and Scandinavian whalers, but here remains vague. The map identifies Cape Hold-with-Hope or Kap Broer Ruys and the rest of Greenland's east coast is noted as 'Ice and mountains covered with snow.' Iceland has been fairly well mapped since the late 16th century and this map shows the four primary provinces. A title cartouche with beautifully illustrated hunters is included in the lower right quadrant. The coat of arms of Norway, Denmark and Sweden are also included above the title. This map was prepared by Emanuel Bowen as plate no. 25 for the 1747 issue of A Complete System of Geography. Rumsey 3733.024. Philips (atlases) 614 (1752 edition).